It costs a lot to take a vacation these days. And while it's hard to find someone who doesn't want to visit an exotic locale, luring them there is getting harder and harder. But what if you could take potential customers on a virtual trip to Australia? Or Rio? or Berlin? Would the sights they see through a virtual reality headset convince them to put down real money to visit there in person? Some airlines are betting they will. At the Lufthansa gate at Berlin's Schönefeld Airport, people awaiting their flight have a new way to entertain themselves. The airline has installed a number of public VR kiosks where travelers can pass the time before they board with a virtual jaunt to Miami. "We want to inspire people to go beyond their borders and do things they normally would not do," said Torsten Wingenter, head of digital innovations at Lufthansa. "For many people, before they spend so much money, they’d like to see what they get. [Through VR,] people have the chance to try before they buy." It's not just current travelers who can take the virtual trips, either. Lufthansa uploaded a 360-degree video to its Facebook page, letting anyone explore new lands at their leisure (though consumers with VR headsets at home surely had a more satisfying experience than those who didn’t). To date, it has been watched by 16 million unique viewers a total of 36 million times. The video has generated more than 46,000 likes and 10,000 comments. "It was the most successful video we've ever launched as a company," Wingenter says. Qantas Airlines started toying with VR two years ago and quickly saw the potential benefits. It launched a video about Hamilton Island, a vacation destination along the Great Barrier Reef in the Oculus store last year. Since then, it has been downloaded 35,000 times and has been watched for a total of 3,000 hours. The video itself is just six or seven minutes long. "We’re quite excited about making virtual reality," David Murray, digital adviser for brand, marketing and corporate affairs and Qantas. "We think virtual reality is the new marketing platform." 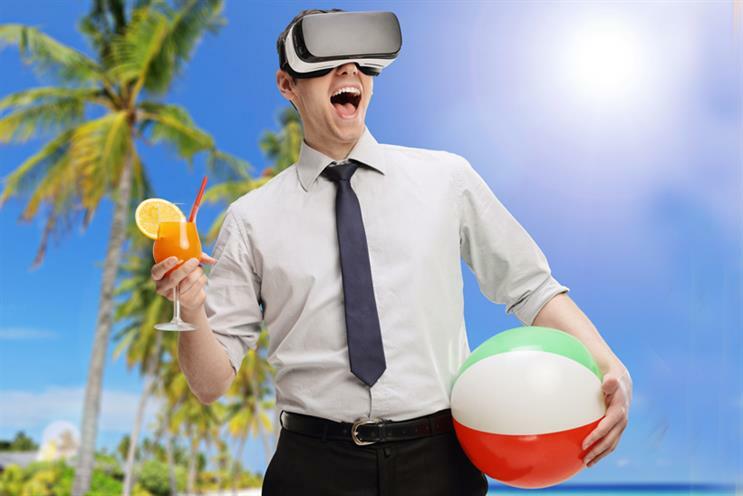 Murray says there are three big advantages of VR for the travel industry. First, it inspires travel. Rather than simply flipping through images, where you glance at them for a second or two, experiencing a locale in VR lets you focus on it and feel as if you're there. For airlines, virtual reality also lets them steer customer attention to things they might not normally pay much attention to: Like service vs. cost. "Customers are usually looking for the best price, so the quality of the experience is almost an afterthought," says Murray. "The great thing about virtual reality is the fact that the experience becomes front and center. It’s a new marketing channel that allows the business to market the presentation." Put another way: If the virtual flight to the destination seems appealing, it's more likely the customer will book with you. Finally, it's a great source of in-flight entertainment. Last February, Qantas made Samsung's Gear VR headset available to premium passengers on some long-distance flights. "For an in-flight experience, being able to consume content individually is [ideal]," Murray says. It’s one way VR might actually make more sense for travel companies than as traditional entertainment. Naysayers have been warning for years that the isolating effect of VR headsets is an obstacle to widespread adoption. But on planes, passengers are more than happy to shut out the world around them for a while. "People are on a flight that lasts 16 hours from Sydney to Dallas-Fort Worth — and maybe they want to be somewhere else during that time." The feedback from passengers was encouraging. "The results have been really exciting: Forty-two percent of people who experienced VR in the first-class lounges rated it nine and greater out of 10," says Murray "Sixty percent who experienced if in flight gave it an eight or higher out of 10." Lufthansa will soon follow suit — and it's planning to let anyone watch the videos. Passengers with their own headsets will be able to download destination content and watch in-flight. "We expect to have 360-degree videos on the server of our planes in the future," says Wingenter. The growing interest from airlines has, not surprisingly, given birth to a cottage industry of travel-centric VR companies. Rapid VR hopes to become a leader in the field by making virtual reality less individual-oriented and more social. The company has created the Puffersphere, a standalone 360-degree spherical display kiosk that shows 360 video in a different way. Imagine a large crystal ball in which you can view the footage from any angle you wish with a swipe of the globe in front of you. Better still, it allows users to pick a location they're interested in visiting and then zoom in to a specialized 360 video from that vantage point. The company, which is working with Qantas, hopes to put the kiosks in the airline's lounges, with the assumption that people who might be hesitant to strap a bulky headset onto their face might be more willing to experiment with this. "Older people may not be comfortable with putting on an isolating headset, but something like this lets you experience [new locations] like a campfire. It's a social experience," says Dan White, director of technology at Rapid VR. Rapid's not the only company trying to move travel-centric VR away from the headset, either. Japan's second largest telecommunications company, KDDI au, last year set up what was called a "Warp Cube" in downtown Tokyo. People stepped into the room, which was filled with LED displays, and were instantly transported to a 360-degree view of destinations including Mt. Fuji; Reykjavik, Iceland; and the Great Wall of China. Down the road, airline and travel companies see VR as a potential way to increase interaction with their customer base. Virtual reality cameras are currently priced in the $350 to $400 range, meaning travelers can capture their own trips and upload them to travel sites, increasing the catalog of viewer options. For now, though, travel companies are rushing to secure an early frontrunner position. Ultimately, they say, achieving that will not only help their bottom line, but the overall travel industry in general. "If we inspire travel in general, we win," says Murray. "If we're able to cut through the competition, then we win again."